Sickle Cell Trait Equals Sickle Cell Disease? 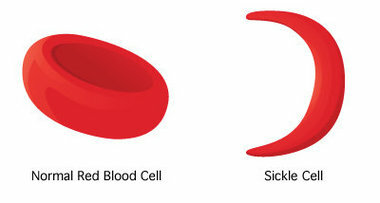 The sickle cell trait is the gene that can cause the offspring of the carrier to have sickle cell disease. One to three million Americans suffer from this blood disorder and 8 to 10 percent are African Americans. Other groups that have high rates of sickle cell are Asians, Middle Easterners, Hispanic/Latino’s and Caucasians. It is estimated that more than 100 million people all over the world suffer from this blood disorder. Are Sickle Cell Trait and Sickle Cell Disease the Same? When someone has the sickle cell trait, they carry the gene for sickle cell. It means they are the carriers, it doesn’t mean they have the disease. They do not suffer from any sickle cell trait symptoms and are perfectly normal. However, there is a chance they can pass the sickle cell gene to their offspring if both of the parents are carriers. If each of the parents gives a child the sickle cell trait, the child will most likely be born with sickle cell disease. People with sickle cell disease can pass it on to their children. Those who have sickle cell disease have sickle-shaped red blood cells that harden and stick together. The cells die off and cause a form of anemia. The sticky cells can also cause blood clotting in the blood vessels which can be very painful. Is Sickle Cell Trait a Concern? For most people who have sickle cell trait, they will experience no symptoms or complications. On rare occasion, there may be a small amount of blood in the urine. Some people have a hard time tolerating high altitudes, or experience serious dehydration, or exercise too intensely. All these can cause the red blood cells to begin to sickle, lead to muscle breakdown, glaucoma in the eyes, and reduce blood flow to the spleen. And finally, there have been, rarely though, reports of renal medullary carcinoma, a rare form of kidney cancer, in people with sickle cell trait. But one concern does exist, that is women with sickle cell trait who are planning to start a family. They should consult a geneticist before getting pregnant. While women with sickle cell trait do not experience any issues during pregnancy, there is a 50 percent chance of passing the gene to a child. There is also a 25 percent chance of the child being born with sickle cell disease if both mother and father carry sickle cell trait. For the most part, sickle cell trait is not a major health concern for most carriers. Women who are planning to have children should take extra steps to make sure both parents do not have the sickle cell trait. This way, parents can make an informed decision about starting a family or prepare for the possibility of having a child born with sickle cell disease. What Are the Risk Factors for Sickle Cell Trait? The good news is laws in most states require all newborns be tested for the sickle cell trait or sickle cell disease at birth. Babies are tested as a requirement before they leave the hospital. Knowing early on can help doctor begin the treatment early and avoid complications. How Is Sickle Cell Trait Diagnosed? If you are in one of the high risk groups above, there is a test for sickle cell trait. The sickle cell trait test is a very easy blood test that can tell you if you carry the gene. This test is performed at most major hospitals and involves a small stick in a finger. For newborns, they usually perform a heel stick. They look at the blood under a microscope and the evaluation will reveal whether or not the sickle cell trait is present. If the sickle cell trait test comes back positive, you will most likely be referred to a genetic counselor. They will ask for your family medical history. If you are planning a family, your partner will need to be tested for the gene and give their family history. This will help with family planning and help reduce the risk of having a child born with sickle cell disease. For more information about sickle cell disease, please refer to: What Is Sickle Cell Anemia? and Sickle Cell Disease.